Catherine Asaro earned a Ph.D. in chemical physics from Harvard University. She is best known for the Saga of the Skolian Empire, her nebula-award winning science fiction epic. She was president of the Science Fiction and Fantasy Writers of America from 2003-2005. Her fantasy epics listed below are romantic fantasies published by Luna. Learn more about Dr. Asaro’s work at her website. Skolian Empire — (1995-2017) Science Fiction. Publisher: A rivalry between the Skolian and Trader empires escalates into all-out war that threatens to bring every Skolian citizen into slavery or result in the destruction of both sides. 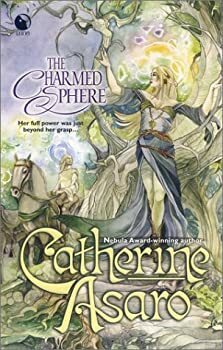 Dr. Catherine Asaro’s award-winning SKOLIAN EMPIRE series has long been on my TBR list because of its unusual blend of space opera, romance, quantum physics, relativity, genetic engineering, biomechanics, and computer science — all written by a Harvard-educated female physicist. That sounds like something I’d devour. 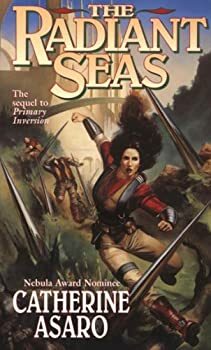 The Radiant Seas is the direct sequel to Primary Inversion, Catherine Asaro’s debut novel which introduces her Skolian Empire. 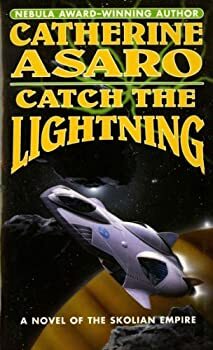 Readers should note that the book Catch the Lightning was published between Primary Inversion and The Radiant Seas, its sequel. If you’ve just read Primary Inversion (which you need to read before picking up The Radiant Seas), I advise skipping Catch the Lightning for now (or forever). This review will contain spoilers for Primary Inversion. 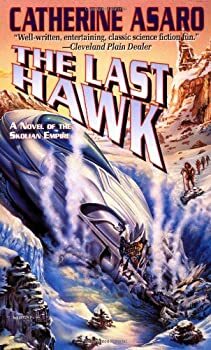 The Last Hawk is the fourth of Catherine Asaro’s SKOLIAN EMPIRE saga, if we’re going in publication order, but it’s the first book about Kelric Valdoria, one of Sauscony Valdoria’s brothers. You don’t have to read the previous three books first (Primary Inversion, Catch the Lightning, The Radiant Seas), but you need to read The Last Hawk before you read Ascendant Sun, its successor. This review will contain spoilers for previous books. 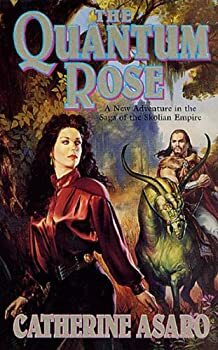 I keep working through Catherine Asaro’s SKOLIAN EMPIRE series. I keep expecting to love the next book, but here I am on book five and it’s still not working for me. The Quantum Rose: A Nebula? Really? 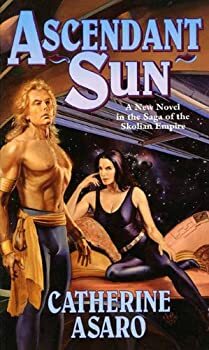 I have really really tried to give Catherine Asaro’s SKOLIAN EMPIRE series a fair chance. As I keep saying in my reviews, this should have been just my thing — space opera written by a female physicist. I should be loving this! Instead, to get straight to the point, so far these books have been mostly insipid insta-love romances with some quantum theory thrown in. As a woman who enjoys hard science fiction, and especially quantum theory, I was disappointed to find that these books do not appeal to me. It’s hard to imagine that they appeal much to romance readers, either, because the romances are so dull. A couple of the books (those featuring Kelric) might better be labeled erotica rather than romance. Misted Cliffs — (2004-2008) The Fire Opal and The Night Bird make up the LOST CONTINENT collection. Publisher: What was the use of being a powerful mage if you couldn’t learn the spells? Once Chime had been the most promising mage in the land, feted and celebrated for her potential and future role in the kingdom. The Iris, he young competitor, made a stunning leap in skill and turned Chime’s world upside down. Now no longer the most powerful, no longer promised to a prince — and still unable to harness her magic properly — Chime was set adrift. As was the new king’s cousin — and former heir — Lord Muller. Yet when the neighboring kingdom threatened war, Muller and Chime were tasked with uncovering the plot. Both were flawed, yet unwilling to accept a lesser destiny than they had once known. Could this quest be the opportunity for redemption — or would it lead them to their deaths? This is not going to be pretty, but then, neither was the reading experience. I'm filled with dread right within the second paragraph, when Catherine Asaro for some reason feels the need to inform me that apple yellow is Chime's favorite color. This dread is not soothed as the scene carries on, full of Chime's rather juvenile observations. She sounds more like she's five rather than almost eighteen, and I'm just not happy. 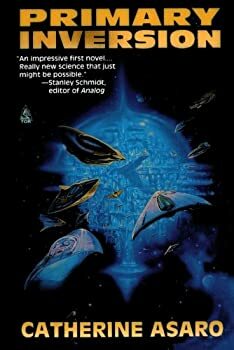 The Veiled Web — (1999) Publisher: Winner of the Homer Award for Best Science Fiction Novel. Ballerina Lucia del Mar has two great passions: dance, which consumes most of her waking hours, and the World Wide Web, which brings the outside world into her tightly regimented life. Lucia’s two passions collide when a White House performance and reception leads to an encounter with handsome Moroccan businessman Rashid al-Jazari, creator of a brilliant technology that has set the Internet rumor mill afire. A second, seemingly chance meeting with Rashid will plunge Lucia into a deadly world of desire and intrigue. For although his work has implications she cannot foresee, there are those who do understand and would turn its great power to their own destructive purposes. As she is drawn deeper and deeper into Rashid’s life and work, cut off from the outside world, she finds herself becoming more attracted to him. But is her seclusion within Rashid’s well-guarded Moroccan home intended to ensure her safety… or her silence? And is it already too late to stop the terrible consequences his new technology could unleash? The Phoenix Code — (2000) Publisher: Deadly awakening. When robotics expert Megan O’Flannery is offered the chance to direct MindSim’s cutting-edge program to develop a self-aware android, it’s the opportunity of a lifetime. But the project is trouble plagued — the third prototype “killed” itself, and the RS-4 is unstable. Megan will descend into MindSim’s underground research lab in the Nevada desert, where she will be the sole human in contact with the RS-4, dubbed Aris. Programmed as part of a top-secret defense project, the awakening Aris quickly proves to be deviously resourceful and basically uncontrollable. When Megan enlists the help of Raj Sundaram, the quirky, internationally renowned robotics genius, the android develops a jealous hostility toward Raj — and a fixation on Megan. But soon she comes to realize that Raj may be an even greater danger — and that her life may depend on the choice she makes between the man she wants to trust and the android she created. The Spacetime Pool — (2012) Publisher: Three works from Catherine Asaro, author of the Skolian Empire series. Includes Nebula award-winning novella “The Spacetime Pool”, novelette “Light and Shadow”, and an essay: “A Poetry of Angles and Dreams”. It's been nearly a year since we played "Rename This Horrible Cover." Far too long! 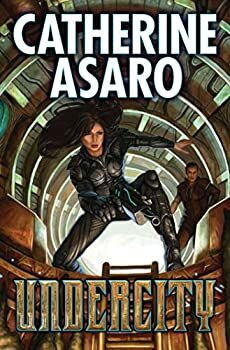 Please help us rename this atrocious-looking science fiction novel by Catherine Asaro. Wow. It's really bad... Well, at least the cover is... We haven't worked up the nerve to actually read the book yet. 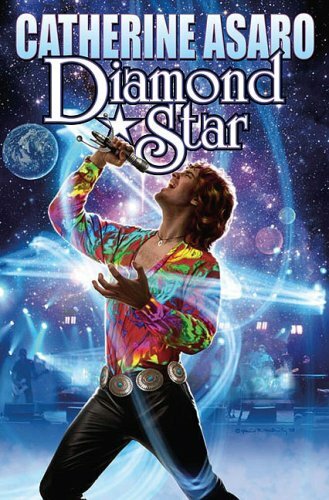 Got a suggestion for a horrible cover that needs renaming? Please send it to Kat.